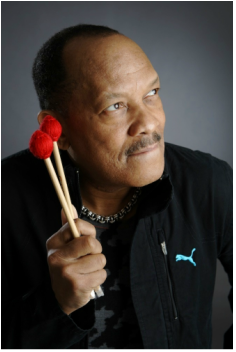 Vibraphonist/vocalist Roy Ayers is among the best-known, most-loved and respected jazz/R&B artists still on the scene today. Now in his fourth decade in the music business, he is known as the Godfather of Neo-soul. His career has seen him evolve from an award-winning jazz vibraphonist into a popular R&B bandleader and an iconic figure still in great demand whose music has been sampled by the hip hop hit makers of today, including Mary J. Blige, Erykah Badu, 50 Cent, A Tribe Called Quest, Tupac, and Ice Cube. Many of Ayers’ songs, including “Everybody Loves the Sunshine,” “Searchin’,” and “Running Away,” have been frequently sampled and remixed by DJs worldwide. Roy Ayers experienced his first national tour as a member of Herbie Mann’s group in the late 1960s. Mann would produce Roy Ayers’ debut recordings for Atlantic. In the 1970s, Roy would sign with Polydor Records and form the group titled Ubiquity. The term Ubiquity (Latin) means the state or capacity of being, or seeming to be, everywhere at the same time. Roy Ayers took his group’s name to heart, for the Roy Ayers sound was virtually omnipresent. This group helped pioneer the jazz-funk sound with numerous hit singles, including “Change Up the Groove,” “Everybody Loves the Sunshine,” “Mystic Voyage,” “Vibrations,” ”Virgo Red,” “You Send Me,” “Lifeline,” and “Fever.” Following this success, Roy Ayers started his own record company and continued touring as a marquee artist on the jazz, R & B, and pop circuit. Recently, he recorded with hip-hop artist Talib Kweli (produced by Kanye West) and jazz/R&B singer Will Downing. Today, Roy Ayers tours a sextet comprised of artists with a deep understanding of jazz, funk, and soul. An exciting album for 2011 entitled King of the Vibes produced and arranged by Roy Ayers is available and can be ordered through RoyAyers.net.